Calling all teachers with some time off this summer! Have you always wanted to learn about Pet Therapy? or anyone else who has the time! Call PC Continuing Ed at 401-865-248 and sign up now! For specific course information, please contact Cynthia at 401-309-4225 or fallyv@cox.net. Pearl Salotto began her teaching, inspired by D.J., at the State University of New York, College at Brockport in 1990. Moving to Rhode Island in the early 90s, and with Maj-En joining the family in 1995, Pearl subsequently began teaching her Pet Assisted Therapy program at CCRI, where it remained for close to 20 years. As of September 2018 the DJ Professional Pet Assisted Therapy Program will be proudly offered at Providence College. Panda Girl joined the family in 1999, as Pearl's program continues to be founded on her unique two-fold philosophy. Pearl is guided by her passionate belief that therapy pets must be bonded with and be family members of the PAT Facilitator and that their eagerness and spontaneity is our guide in the field. Additionally, PAT is a profession and the PAT Facilitators must be educated in PAT within a college or university environment, as are other professionals. 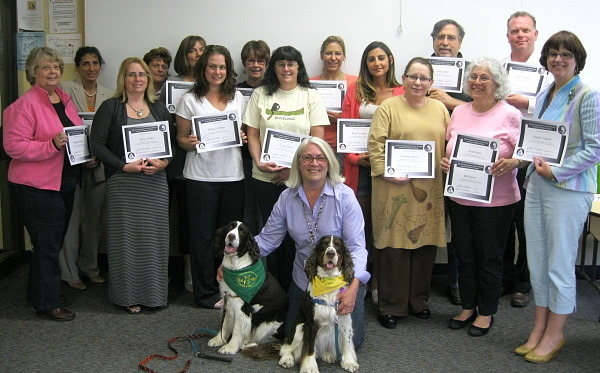 Course I, The Ethical Foundation of PAT, includes lectures, discussions, visiting credentialed PPAT facilitators, with their family pets, as guest lecturers, videos and field trips. We cover research in the profession, history, ethical, legal and safety issues, the link of abuse, The"D.J. Respect for Living Things" program (a pet-inspired violence prevention and anti-bullying program), as well as how to set up goal oriented, treatment based programs. This course is 10 weekly classes, 9 of which are held as an evening class. One is temperament testing for pets and is typically held on a Saturday morning. Course II, Building the Bond: Hands-On/Paws-On Learning, family therapy pets along with their guardians, are provided the opportunity to experience sights and sounds of facilities where they will work, including elevators, wheelchairs, fire alarms, patients in bed, etc. This course includes lectures, practice and field trips. This course is 8 weekly classes and is typically held Saturday mornings at Elmhurst Extended Care. Course III, Experiencing the Joy, students and their family therapy pets will actually have an opportunity to provide PAT treatment. This 20 hour internship experience is also part of the program and is typically divided into 2 segments. Part A is generally at one of our training sites: Elmhurst Extended Care or the Cranston Arc. Under the loving mentorship of Heather Siravo or Joanne Bertone, respectively, students will be able to provide PAT treatment with supervision and will additionally learn about PAT guidelines, referrals, goal setting and documentation. Part B starts after the completion of 10 hours (generally 1 hour/week). Students in Part B, for an additional 10 hours, will create their own PAT program in a facility which previously has not had one, based on their pet's personality and interests, as well as their desire to build a better world. This program not only provides benefits to countless individuals, but is such a win-win situation, because for the "natural" therapy pet, their lives are enriched in ways beyond measure – which one has to experience to truly appreciate. In our humble opinion, there is hardly anything in the human experience as fulfilling as seeing your beloved pet so happy, while bringing joy to others, as well. For further information on the program please feel free to contact Director Cynthia Vanaudenhove at 401-309-4225 or fallyv@cox.net.